Manuscript, Five Books of the Torah, with the Masorah. [Yemen, 14th/15th century]. Large-format volume, incomplete. Fine Yemenite scribal script, vocalized, with cantillation notes, markings for ends of verses, and spacing between sections (petuchot u'setumot). Some of the Pe letters are winding. The Masorah is inscribed in the upper, lower and right-hand margins. 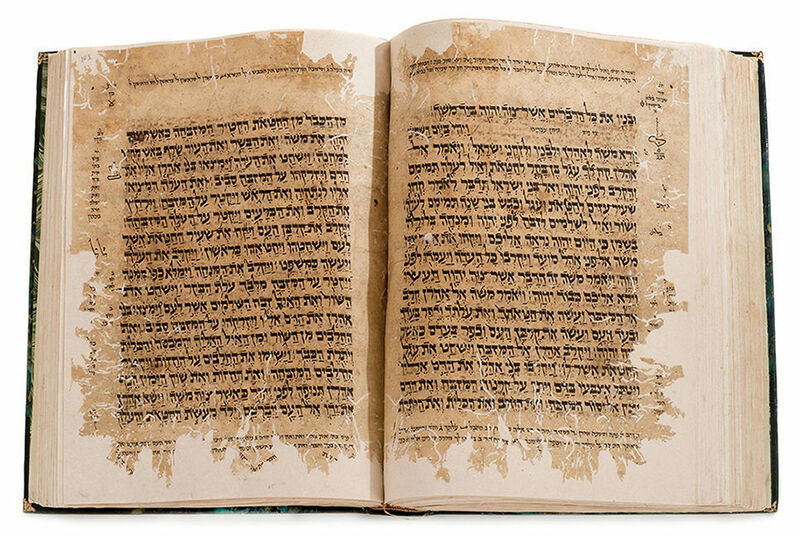 On some leaves, the Masorah is written ornamentally, in micrographic style. This manuscript contains parts of Bereshit and Shemot, Vayikra (complete, though with damage to text), parts of Bamidbar and of Devarim. The first part of the manuscript (Bereshit-Vayera) has geometric ornaments in black and red ink in the breaks between the sections. At the end of the Masorah list in the top margin of p. [44a], the scribe wrote: "May the writer earn merit and blessed be the reader". leaves (including several leaves from a later period). 34.5 cm. Fair condition. Severe worming to every leaf, significantly affecting text. Damage professionally restored with paper. Several leaves completed in later Yemenite script. Several places repaired with pieces of paper containing text replacement in late Yemenite script. New binding.